August 24, 2017, 7:09 PM · I’m not quite sure what I expected as I drove through the first security portal at Oak Ridge National Laboratory. Sure, I knew this was where the bulk of the atomic bomb was created back in the ‘40s. I knew the sprawling campus housed a plethora of brilliant scientific minds from around the globe. I knew there were enough PhDs onsite to literally sink a ship. I was also keenly aware of my own personal struggles in the areas of science and math. And yet, here I was, about to interview six accomplished scientists. Me! The person for whom S.T.E.M. has always, and will always, simply mean the stalk of a plant. So why, you might ask, was I even allowed into ORNL? Why had these scientists agreed to speak with me? And what could we possibly have in common? Violin, that’s what. You see, my scientists had volunteered to discuss their personal connections between playing a string instrument and their field of scientific study. And I was set to listen and learn. I had not expected things to be quite so “ordinary” in this truly extraordinary setting. And the same was true of the people I met… we’ll reverentially call them “Les Six”: Jerry, Melissa, David, Lauryn, Travis, and Kate. Six truly extraordinary ordinary people. Jerry is a Research & Development Staff Scientist in the Center for Molecular Biophysics. (Yes, he’s scary smart.) Jerry has three degrees in Chemistry, including a PhD, and describes himself as a computational chemist/biophysicist. He fits the mold pretty well — thoughtful, analytical, somewhat reserved — until you ask him about his six-year-old daughter. Then you see the real Jerry — a frustrated father completely baffled by his daughter’s resistance to practicing the violin. (Well, actually he can relate.) Jerry started violin himself at age 6 with the Suzuki method and worked his way through Book 5. Now he helps his daughter between her Suzuki lessons. So when Jerry’s not determining how mercury is converted from one form to another, or grappling with antibiotic resistance, he’s playing “Waltz” with his little girl. Melissa is a Research Scientist in Environmental Engineering in an area dramatically titled Climate Change Impacts on Critical Infrastructure. She uses computational and analytical tools to discover vulnerabilities to extreme weather and climate in the nation’s critical infrastructure. (Whew!) And she knows her way around the violin. Full disclosure: Melissa plays first violin to my second in our string quartet dubbed the “Jewel Tones.” We attended the same university in Colorado, albeit a decade apart (I’m older), and then both ended up living in the south. She is the person responsible for bringing me out of violin exile. Melissa started lessons at age 9 and never stopped playing or performing. She was awarded a violin scholarship at her college and went on to teach and perform in the following decades. Her repertoire included the mainstays — Bach sonatas and partitas, the concertos of Bruch, Kreisler, Lalo, Saint Saens, and Mendelssohn — to name a few. Then, in her mid-forties, Melissa took a career detour and earned degrees in both Environmental Engineering and Energy Science & Engineering (PhD). David, a summer intern with Consolidated Nuclear Services, is simply an inspiration. David is an electrical engineer. But, in truth, he is first and foremost a cellist. There was a time when David played up to 12 hours a day while working toward his cello performance degree at Oberlin Conservatory. Now he conducts research to test a new model of remotely monitoring liquid levels and creates computer coding for controlling a laser profilometer, an instrument used to measure the earth’s profiles. (Yes, I looked it up.) Interesting work, no doubt, but a far cry from Tchaikovsky, Beethoven, and Bach. David started violin in 4th grade and switched to cello in 8th. At Oberlin he got involved in “new music” and some interesting connections with science began. He joined the Contemporary Music Ensemble, which involved performing electronic music, building new instruments, and even inventing certain types of musical notation. He dreamt of becoming a cello professor with a specialty in contemporary music. Then the hand pain began. Ultimately, David envisions a future working with synthesizers, music software, and coding. His dream job is at a conservatory, building and maintaining electronic musical equipment and software, and teaching classes on digital music theory and acoustics. In the meantime, he’ll continue his work as an electrical engineer, play cello at weddings and church concerts, and maybe even perform at “Big Ears,” one of the most prestigious new music festivals in the U.S. (which happens to be in his own backyard of Knoxville, TN). He appeared at Big Ears last year and I think it’s safe to assume there will be a repeat performance. Lauryn, a vivacious Research Assistant in Geographic Information Science, holds a degree in Anthropology. She analyzes imagery and conducts research on population density outside the U.S. Lauryn was given a violin at age 4 and started lessons the following year. Although violin has not been a constant in her life, it made a lasting impression upon her. In fact, she’s decided it’s time to get the violin back out and start with some online lessons. Lauryn, a Research Assistant in Geographic Information Science who also has played the violin since age 4. As someone with an anthropology bent, Lauryn wants to know who the people are that she’s analyzing, where they’re going, what is happening in their culture, and why they follow their traditions. “I want to know why there is conflict and why there is harmony. It’s absolutely no different with music. I want those same questions answered.” Lauryn’s father is an accomplished violinist and Lauryn hopes to perform with him in the future — a dream she will no doubt make a reality. Travis is a post-doctoral researcher in Nature Inspired Machine Learning with a PhD in Math. He works in Artificial Intelligence, writing code that mimics the way a brain works, recognizing features a human would look for in a visual image. Travis started piano at age 5 and added violin at 13. He played in school orchestras and ultimately worked through Suzuki Book 5. In college he continued to play and joined a community orchestra. (He claims he’ll play in any orchestra where he doesn’t have to audition.) He keeps up with the keyboard as well, playing piano and organ at his church. Kate is Group Leader of the Computational Earth Sciences Group and studies how well models simulate Earth, in particular large scale atmospheric dynamics and the fate of the Greenland ice sheet during climate change. (Whew, again!) With degrees in Physics and Atmospheric Science (PhD), she manages scientific staff and programs — a huge job which she approaches with enthusiasm and energy. It’s ironic that Kate’s mother, a professional musician, wanted to pursue astronomy and science, but back in the day was told, “No, dear, it will tire your eyes.” She pursued music instead. It must make Kate’s mom proud to see her daughter’s incredible scientific accomplishments. 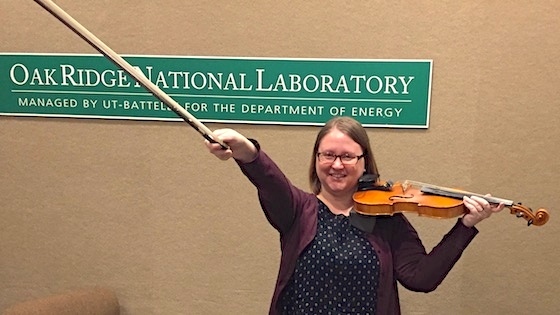 While each scientist I spoke with had a different story to tell, one common theme emerged: Stringed instruments are extremely difficult to play, yet there is great satisfaction in breaking through each incremental barrier along the way. Scientists must also break things down to their most basic level first. Science holds incredible challenges and progress is made only through the day-to-day drudgery of whittling away at issues. Built into the pursuit of music is the reality that you must start at the most rudimentary level in order to achieve anything close to greatness. And you must often revisit the rudiments to make significant progress. Les Six placed a premium on the importance of music in terms of understanding how to tackle tough technical issues one step at a time. Perseverance, persistence, and the desire to move to the next level were noted as attributes that connect music and science. A fairly ordinary connection — one with extraordinarily powerful results. August 25, 2017 at 06:04 PM · I really enjoyed reading this. August 25, 2017 at 06:45 PM · Your community reminds me very much of our community in Santa Fe, New Mexico, where our Suzuki violin and viola "family" at Santa Fe Talent Education includes so many people from our national nuclear laboratory at Los Alamos, including one veteran of ORNL, as well as people in the scientific community at the Santa Fe Institute! The parallels, connections, and overlap is amazing! e and is continuing lessons at the Santa Fe Talent Education program. Yes, there is a strong musical link between the two scientific communities. August 25, 2017 at 10:28 PM · Enjoyed the article! While I am nowhere near the caliber of those six scientists, I am a violinist, programmer, and have pretty good math skills. It doesn't happen often but what I enjoy programming for the most are functions and other tools used on data created or read by the music notation / midi program I use. Many other users of that program share their code in a forum for that program. August 26, 2017 at 12:11 AM · I would like to salute Diana Skinner for this rare look inside the lives of often anonymous, brilliant scientists AND Violinist.com for the courage to print articles like hers that are sophisticated, well-written, and inspiring. I'd like to commission Ms. Skinner to take her notepad to the halls of Congress to determine if there are any instrumentalists in those ranks who might use a mutual love for their instruments and Mozart as a common ground to get truly useful things done for the greater good of our country. That's an article I think everyone would read! August 26, 2017 at 12:31 AM · Makes me wish I was starting all over again: get rid of the doubts, false starts, backtracks; long hiatus from violin (from age 13 to age 60), and gotten to play with MY Dad, a wonderful violinist. But like a lot of you, probably, I wanted to do EVERYTHING! Math and Science led to Sociology of Science, and to Science Policy....and now retired, I'm focusing on the music, and playing chamber music with friends. August 26, 2017 at 03:16 AM · I am so appreciative of the thoughtful comments! I truly stand in awe of scientific minds and it was a delight to interview these individuals. It is always heartening to realize that music plays such a deep and powerful role in so many lives. In fact, maybe for those who work in fields other than music, there is a special recognition of just how vital music is to our day-to-day wellbeing. August 26, 2017 at 06:45 AM · Diana, I really appreciate what you wrote and conquer with it. Earlier in my career, I was a management consultant working for a global firm and we were always reminded to hire industrial engineer because of their training in taking a complex machine and bringing it down to pieces then putting it back together. This is was true when we had complex issues working on a organization structures and process inefficiencies. So industrial engineers did very well. Fast forward many years later, I started learning to play violin at the age of 47 (I'm 51 one). As you can anticipate, learning music requires taking a complex piece and breaking it down into phrases or passages or even few notes (specially that I was a novice). This mindset of decomposing a problem became very apparent and it helped apply it to other areas of my profession. I'm not CEO of a large company and this mindset is exactly what I try to instill in everyone that works with me. Thanks again for sharing this article. Great job! I have sent you an earlier reply (about industrial engineers.... ) but I realized that I was not logged in. so it went as anonymous. August 26, 2017 at 03:07 PM · Thank you, Mohammed! It's heartening to know there are CEOs out there like you. Your perspective is refreshing. And I wish you much continued success with your violin!! August 26, 2017 at 05:44 PM · A very insightful article on the relationship between music and science. All young parents should read this excellent article. I am a FAA licensed "Aircraft Repairman." I qualified for that credential the same day the 300 HP experimental airplane I built and wired was certified as "airworthy." This was a post retirement goal of mine after years of flying jumbo jets around the world for FedEx. Around that time, circa 2004, I put down my banjo and learned to play the fiddle. Now I teach inner city kids how to do the basic level maintenance and adjustment for the bowed instruments of their after-school orchestras which are run by small non-profits. So the drive train of your ORNL folks' career progressions seems to have a reverse gearing available. Capt. Terry Miles, String Wizards, Chicago. August 27, 2017 at 02:50 AM · Captain Miles, I can't begin to tell you how much I admire what you do! Bravo! And thank you for your comments!! August 27, 2017 at 01:13 PM · As a young child I was considered good at math and music although I certainly would not be considered a "math whiz" or a prodigy -- neither then nor now. It's really just that my parents encouraged those things, so I got an early start and I worked hard at them because I wanted to catch up to my two older brothers who were doing those things already. I personally don't have the feeling that musical education helped my development as a student or scientist (I'm a tenured chemistry faculty member at an R1 university). Rather, I feel that both aptitudes are parallel outcomes of some other, more fundamental aptitude that somehow underpins both musical and quantitative-reasoning talents. That is to say that I believe the two to be strongly correlated, but at least in my own case I can't find a causal link -- it just doesn't ring true for me. When I hear about a woman who started violin at 9 and became both a fine violinist and a scientist, my first thought is that a person's basic intellectual aptitudes are probably already in place by age 9, and both music and STEM grew naturally from that common soil. Music. Rocket science? Hardly, but the two disciplines are most certainly interrelated. An excellent article. It brought back memories of my days at Bell-Labs where I was a lowly "Subject Matter Expert" floating in a sea of multiple Ph.D's many were also amateur musicians and there were informal groups occasionally performing in the main hall just for fun. I was a very-late starter (30) on the violin. Unfortunately I had one of those 80% travel jobs which negatively impacted my violin playing until I retired. I kept my hand in but progress was slow in those years. It seems that people who achieve a lot also do a lot. Perhaps that is the real life-lesson.